Soldiers and community members had access to more than 50 universities, trade schools, and military benefit programs at the annual Fort Irwin Education Fair on September 25. 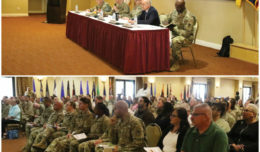 The event was organized by the Fort Irwin Education Center and was designed to showcase the array of opportunities available to prospective students during their time at the National Training Center. 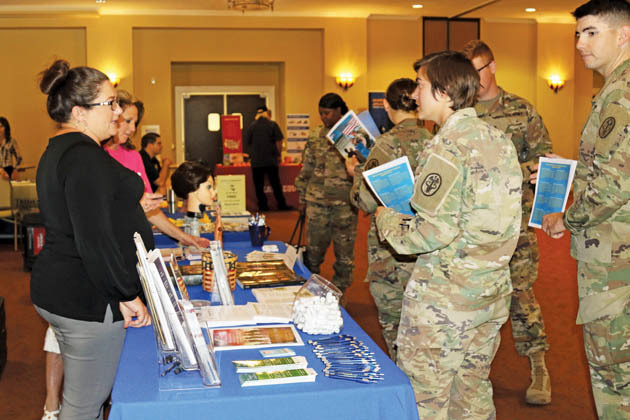 FORT IRWIN, Calif. ­— Representatives of more than 50 universities, colleges, career centers, and military benefit programs offered guidance and information to the Fort Irwin community at the annual Education Fair on Sept. 25 at the Sandy Basin Community Center. 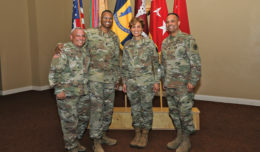 This year’s event showcased the expanding array of opportunities available for Soldiers and family members to pursue their educational and professional goals. That range included everything from technical certifications up through associate, bachelor’s, master’s, and even doctorate degrees. It also spanned both private universities, such as DeVry University and National University, and public universities, including California State University and Pennsylvania State University. In addition to traditional college programs, the Education Fair also represented schools that target specific industries. For example, a seven-week course from Airstreams Renewables, Inc. trains students to work on renewable energy and communications towers, and the Heavy Equipment Colleges of America offers training programs ranging from three to nine weeks to certify heavy equipment operators for the construction trades. Representatives were also available from the Los Angeles and Las Vegas Police Departments. The Education Fair also debuted Grand Canyon University as a resident school at the Fort Irwin Education Center, as well as a new partnership with the University of California, Los Angeles (UCLA). Grand Canyon University is a private Christian university based in Phoenix and has more than 150 online and evening degree programs available. 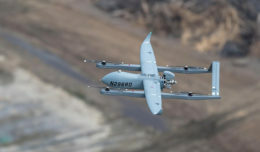 It joins four other resident schools at Fort Irwin, including Barstow Community College, Park University, Trident University International, and the University of Maryland University College. In its partnership with Fort Irwin, UCLA will be offering more than 5,000 programs, including more than 200 professional designations and certificates, through UCLA Extension. The courses can be completed either at Fort Irwin, online, or in a hybrid format, according to Jason Bender, the UCLA-Fort Irwin liaison. While many of the programs and schools represented at the Education Fair are available online, others provide courses in the classroom or hands-on learning experiences. Prospective students were encouraged to shop around and learn which programs best fit their goals and needs. Members of the Fort Irwin community who are interested in furthering their education can visit the Fort Irwin Education Center in Building 1020 at the corner of 3rd Street and F Avenue, or call 760-380-4218. Counselors can connect students with both resident and non-resident schools and programs, help students navigate financial aid opportunities, and offer guidance on educational goals.